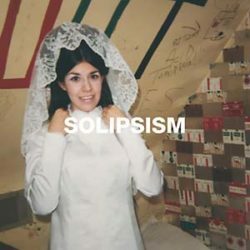 Solipsism is an archival release of music from Mike Simonetti’s tenure as owner of Italians Do It Better Records, spanning from 2006-2013. During that time Mike wrote a lot of music. Some of it was used for films, some for TV commercials, some for fashion shows and he even released a record or two. Influenced by the intersection of ’80s arena rock bands like AC/DC and Judas Priest, glam rock/dance bands like Rockets and Supermax, and especially the underground Italian producer Piero Umiliani — the album is chock-full of atmospheric rock-inspired arpeggiated riffs. The mixture of metal and chugging dance music makes for a unique listening experience. Every song has a riff, every song is heavy and dense. Only one song goes above 118 bpm. These are heavy chuggers that make for a tense emotional experience that exceeds your standard, easy-to-write-off “soundtrack” fare, mainly because it was never written with that in mind. It was meant to be a fist-pumping arena rock inspired thumper. You can hear that in the one two punch of “A Prayer For War” into “Illusions,” which is an outtake from his “The Magician” sessions. Other songs like “Solipsism” showcase the airy melodies that were to come with his other project Pale Blue. If you listen closely, you can hear how Simonetti’s music and dark vibes inspired his then label partner Johnny Jewel to take his own bands Chromatics and Glass Candy in a different, more cinematic direction. This was written and recorded years before the Drive soundtrack and all the hoopla around the sudden soundtrack resurgence. In 2011 Mike was asked to submit some songs for a soon-to-be-released Hollywood remake. He submitted most of the songs from this album, and they were slated for release on the soundtrack, but the project fell apart, and the film went in a different direction and changed producers. Soon after, because of all the drama and foolishness, he left Italians Do It Better to start over with 2MR and Pale Blue. This is the nail in the coffin. Godspeed.